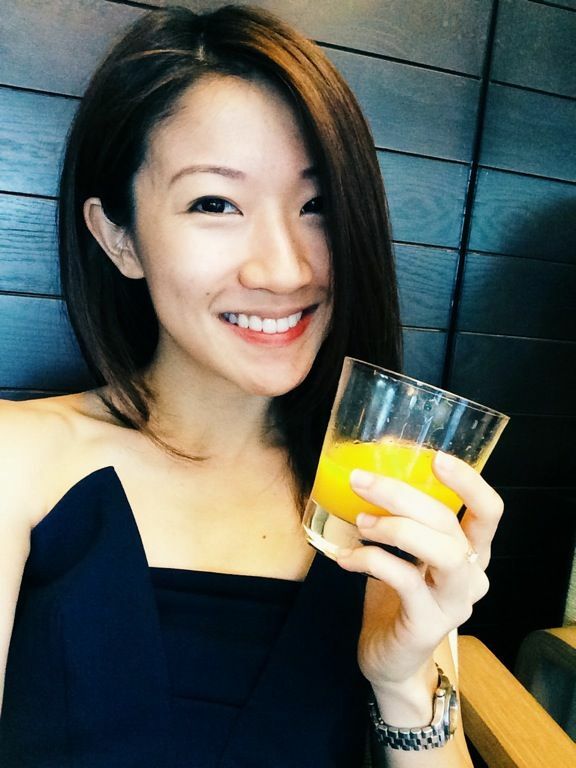 It's been some time since the first MasterChef Asia was crowned and we have waited with anticipation on what winner Woo Wai Leong would come up. Well, Restaurant Ibid was worth the wait as Wai Leong went back to his source, and roots to search for his identity. From these dual inspirations comes Nanyang-style, Contemporary Chinese cuisine which marries his heritage and western kitchen training. Dinner is a multi-course affair- 4 course $78, 6 course $88, 8 course $118. Dinner started with 2 snacks and i must say i enjoyed the Spring onion shao bing a lot more than i did the Skewered escargot skewers. 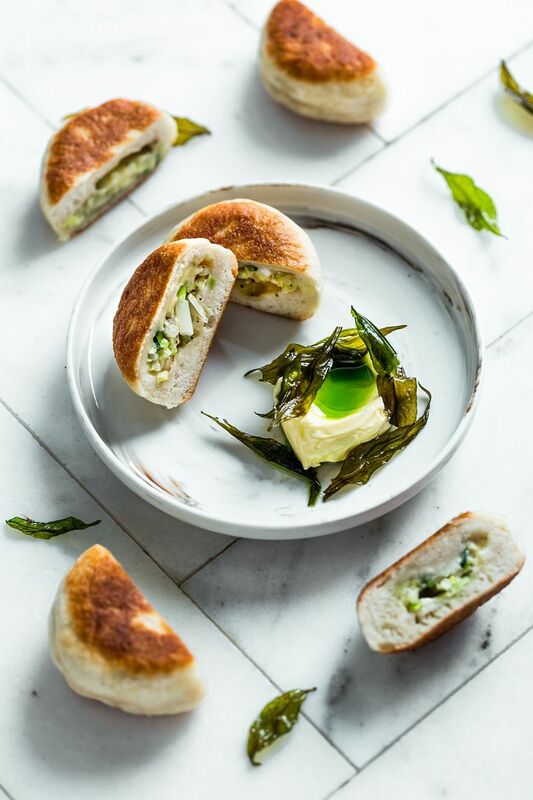 The shao bing took on a stuffed English muffin appearance with a filling of spring onions, mozzarella, black pepper and sesame oil. I couldn't stop eating it with the yeasted butter and laksa leaf oil. The dou bang jiang mayonnaise flavored escargot is not for everyone, unless you're ok with bitter betel leaf. If you're expecting a Tea egg, like the dark braised sort, well, there's nothing like that here even though the inspiration came from that. 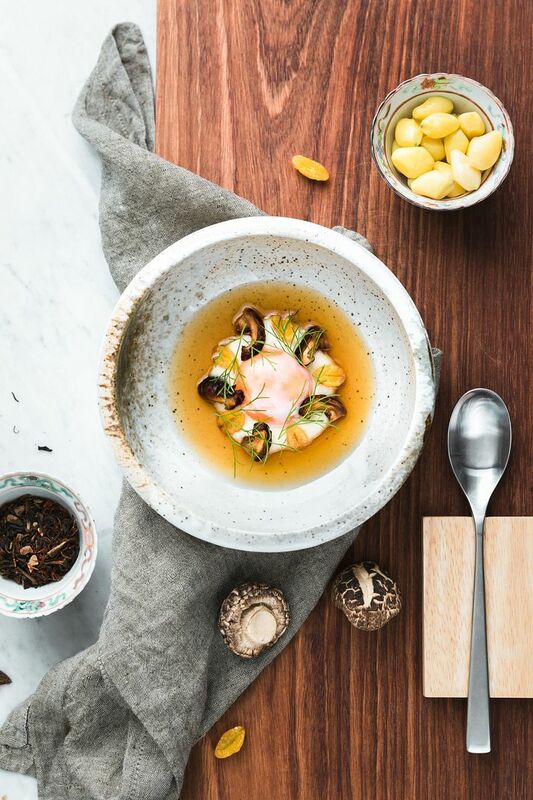 Here we have an organic egg yolk is sous vide at 65 degrees for 1 hour, flavored by a Mandarin pu-erh broth, a creamy sour cream onion puree, and a brown butter fried shiitake mushrooms and gingko nuts. 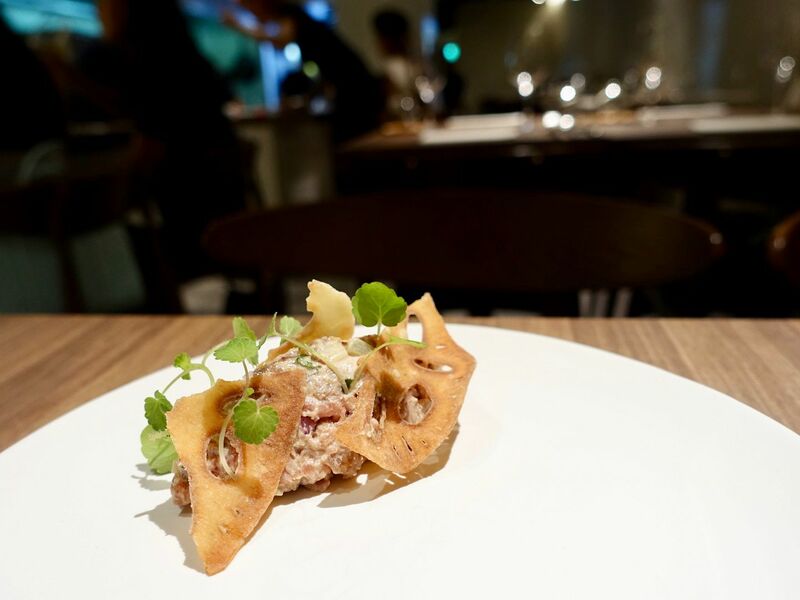 A radical dish is the Lamb tartare, which was inspired by the Chinese lamb skewers. The flavor of the lamb is heavy and punchy as it is mixed with cumin, dried chillies and szechuan peppercorns. 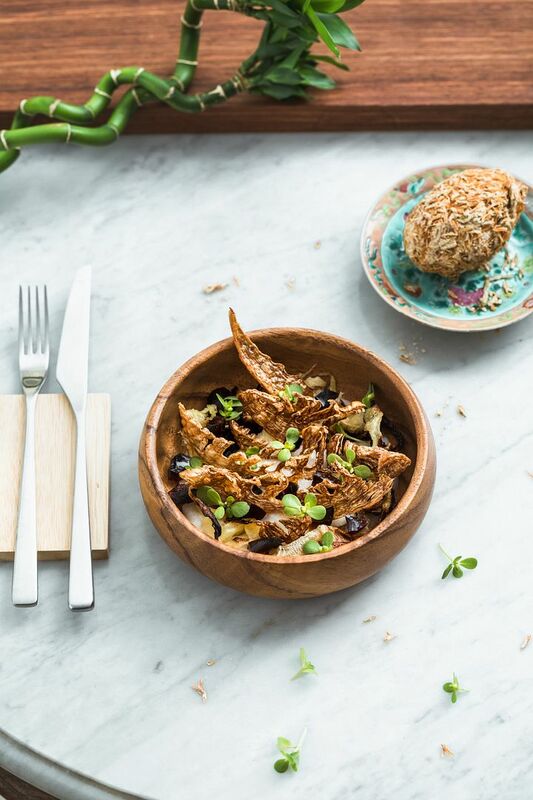 The hand-chopped meat is dressed with roasted garlic yoghurt and garnished with mint leaves, served alongside deep-fried lotus root. One of my favorite dish of the night was the White radish porridge. The porridge is cooked overnight in a thermomix with white radish trimmings and soy milk, and flavored with more radish strips chye-poh style. To top it off, there's century egg (yolk dehydrated powder form and whites as they are), fried bamboo shoots. The flavor is like a Cantonese style fried carrot cake. Lovely! 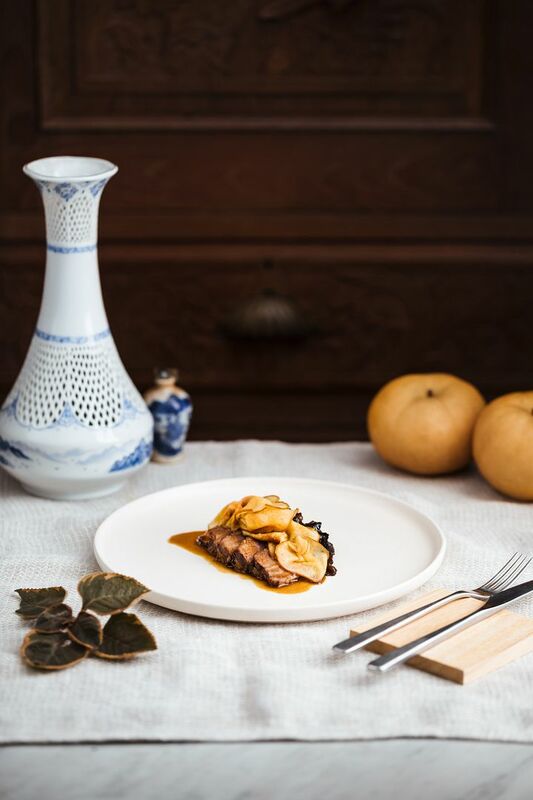 Anglica root is usually used to cook chicken soup but Wai Leong infused some of that flavor in a chicken jus to flavor the sous vide Short rib. You wouldn't think the meat was cooked in a water bath as it maintained a nice meaty flavor though it did have some jelly in it. The black garlic mash potato added a marmite umami to the dish, just like the slightly crunchy pickled black fungus did. Another dish that brought back childhood memories was the Momoiro collar. 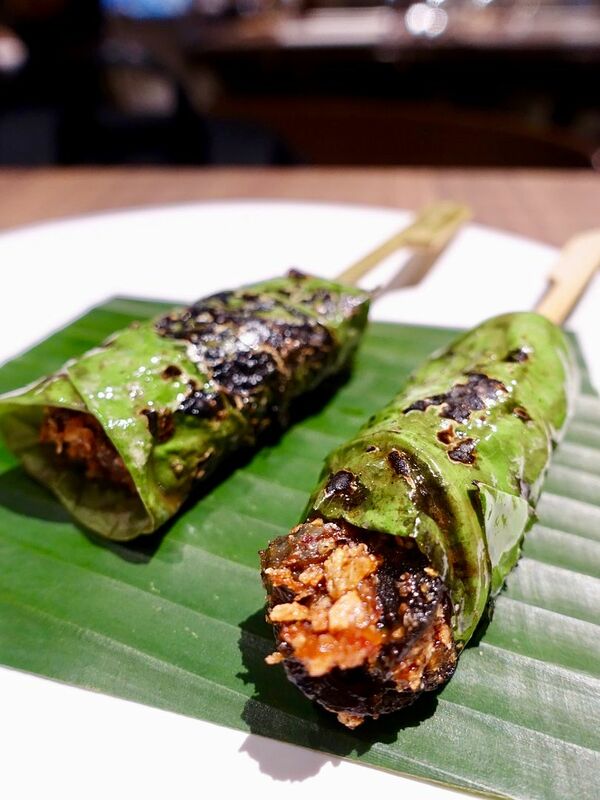 I believe the flavor that brought on the memories came from the gastrique made of caramel glazed with black vinegar, red fermented beancurd and red rice wine lees. Love the sweetness in this one! 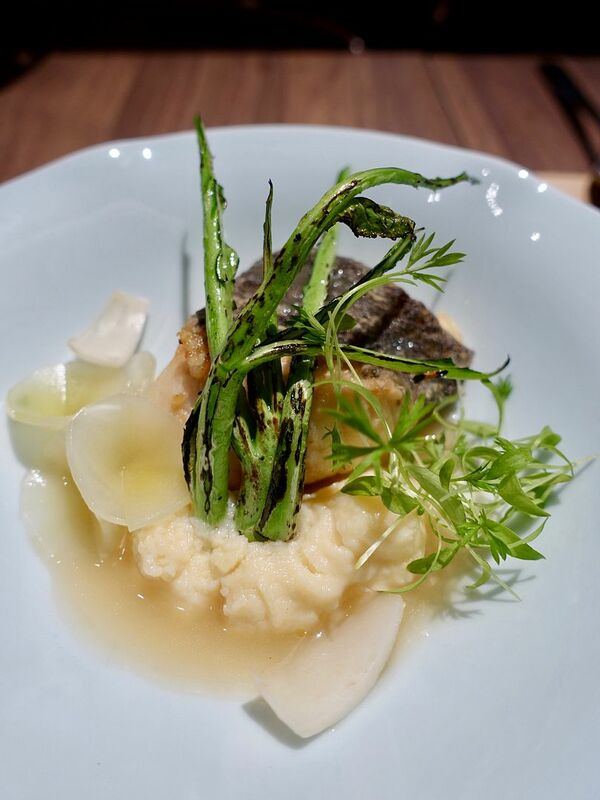 Grouper is sourced from Ah Hua Kelong and the firm fish sits atop a gorgeous tofu butter purée. The sauce is a Shaoxing fumet made with fish stock, butter, shaoxing, shallots, black peppercorn. Simple but so good. All night i was looking forward to the Lotus rice with mushroom, foie gras, and preserved liver sausage. 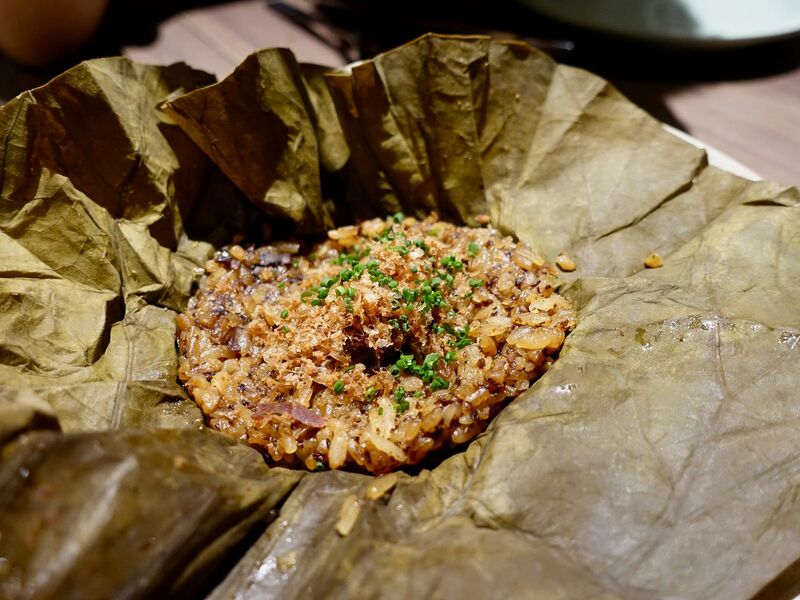 Short grain and glutinous rice are steamed in a rice cooker with kelp and layered with lotus leaves to infuse lotus and umami flavour. Seared foie gras tops the lotus rice, together with steamed, frozen, then grated preserved liver sausage. This tastes like a Hokkien Ba Zhang (rice dumpling)! When eaten together with the foie gras, it kind of overpowers the Asian flavors. Finally desserts. 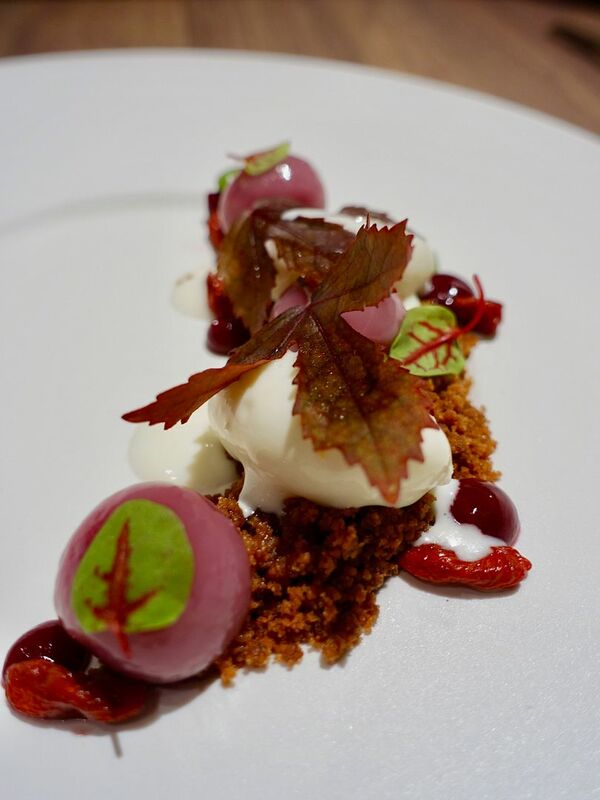 The Hibiscus Dessert is a reinterpreted tang yuan soup, with a rosella tang yuan (rice balls), red bean jam, Chinese ginger sugar crumble, and yogurt ice-cream. My preferred dessert was the Soy milk ice cream. 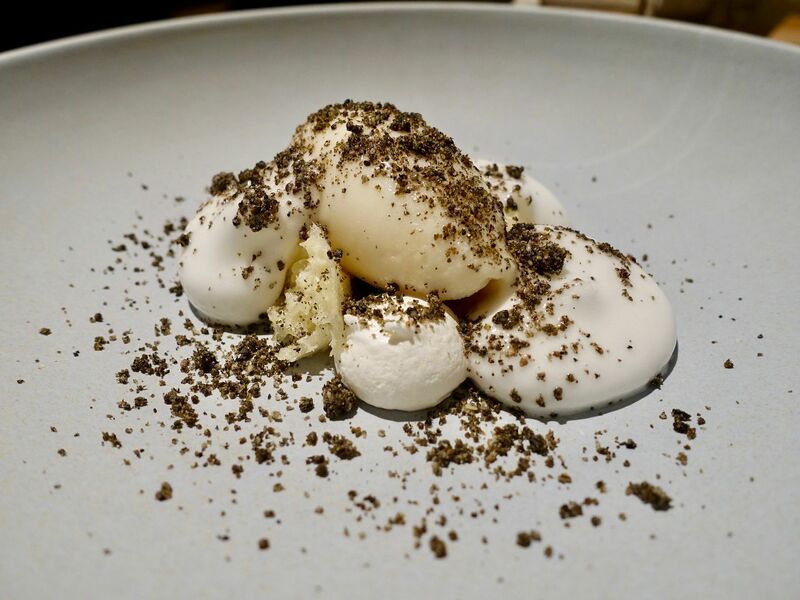 There's a distinct almond milk flavor in the foam, with black sesame powder and a sesame oil espuma cake. Apparently there’s a subtle pepper at the end but I simply couldn't taste it! The dishes at Restaurant Ibid are definitely one of its kind. 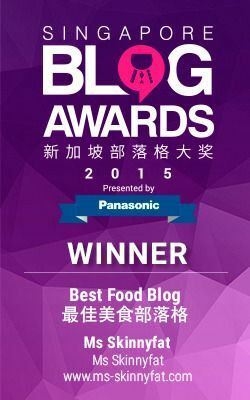 Looking forward to more of Wai Leong's Nanyang cuisine. We hear that lunch service would be starting soon.